This time it is creating a “Starburst pattern” with some common SU! punches. card base River Rock Textured CS 6-3/4″ square folded in half to create a long card. Punches needed to create starbursts Using image from Boho Backgrounds, stamp Blue Bayou ink on Blue Bayou CS and Scallop Punch x2 to create the starburst pattern. 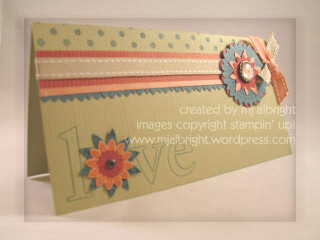 Using image from Boho Backgrounds again, stamp Groovy Guava ink on Groovy Guava CS and use 5-Petal Flower Punch. 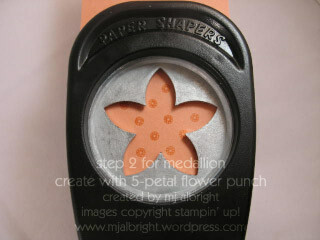 Place punched flower back into the 5-Petal Flower Punch as shown and punch again. 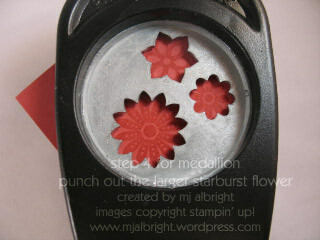 end result is a starburst created with the 5-petal flower punch. 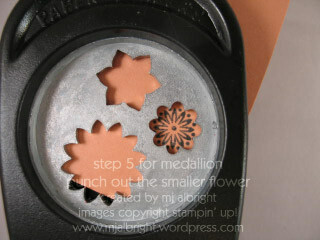 Next layer to medallion is the larger of the 3 flowers from Boho Blossoms Punch. Stamped image from One of a Kind stamp set with Rose Red ink on Rose Red CS. 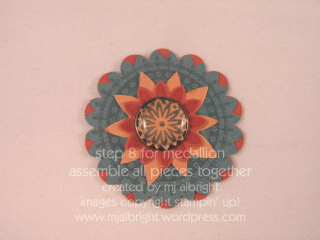 Focus for next layer is now on the small flower from the Boho Blossoms Punch. 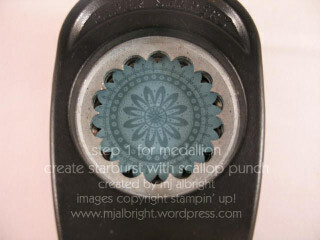 Used Blue Bayou ink on Groovy Guava CS and punched out small flower. Now, you’re dealing with a very small punched flower. The best way I could come up with is….flip the flower over and place a Mini Glue-Dot on the back of it. 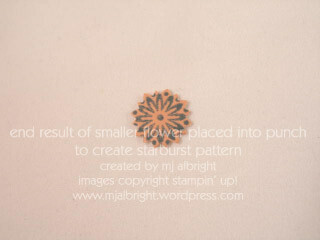 Slide back into the Boho Blossoms Punch and use a tooth pick to get the flower where you need it to be to create the starburst punched pattern (don’t worry about that glue dot, it is the back and will be needed to adhere). 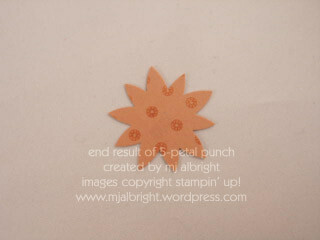 This is the end result of the small flower punched x2 to create a starburst pattern. I then attached this to a Pewter Build-A-Brad. 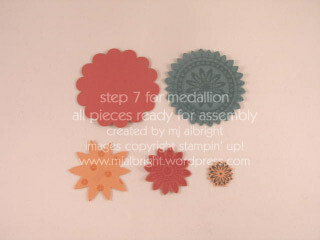 Here are all the pieces punched and ready for assembly to create the starburst medallion. Finished assembled starburst medallion. For the mini medallion (the “o” in the word love), I just did the last three steps and added a pewter brad from Vintage Brads Assortment. Used Jumbo Outline Alphabet and Blue Bayou ink to create sentiment. But wait, there’s more. Did you see the spiked scalloped trimming running horizontally across the card. 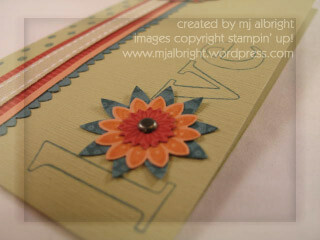 Well, I did a tutorial about using the Scallop Punch to create a mini scalloped border. 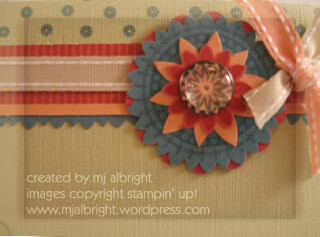 If you do step 1 (create the starburst circle) and punch out the middle (or cut with paper snips), you now have a spiked trim created to coordinate with the starburst medallion. just bend to desired shape/pattern. I played around with this, and I recommend the same and find which way you prefer. If you punch the 1-3/8″ Circle Punch first, you have to cut the starburst and try to work it back into the punch small sections at a time. 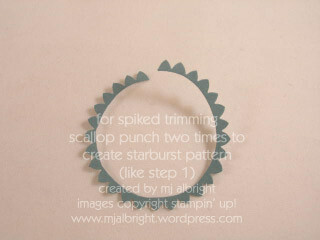 If you do the scallop punch x2 first to create the starburst, you either have to do a guestimate where to use the 1-3/8″ punch or just use paper snips. YAY!!!!!! I can’t wait to meet you!! This is Fabulous! I just got this set and never would have thought of all your possibilities. Thanks for another great tutorial. YOU ROCK, ROLL AND SWAY GIRL!!!! Thanks so much for the tutorial. Can’t wait to try this! Your card is super cool!!! The tutorial is great…I’ll try it and let you know what I came with!!! First of all, I just LOVE this tutorial! You’re brilliant. Secondly, I’m going to CHA too with Paper Pretties, and I’m so excited that so many of my favorite stampers/bloggers will be there too!! Gorgeous card!! Thanks for the tutorial showing all those cool flower punch tricks! So excited you’re going to CHA, I’ll be thinking of you and sending you hugs and good thoughts on the plane ride! Thanks for this! I love what you did. Way to think outside the box! Awesome new idea’s. Thanks!! You are fabulous. I LOVE all the recent posts!! Congrats on going to CHA!!! There’s no way I’m going to that much trouble to make starbursts! LOL But thanks for the tutorial, I’m sure lots of ladies will do it!!! GORGEOUS card and thanks for the awesome tutorial with pics to go along!!! Love the colors! OH MY GOSH! I CAN’T WAIT TO MEET YOU! And yes, I’m shouting. I can’t WAIT! When you’re good, you’re good! Thanks for these tips. 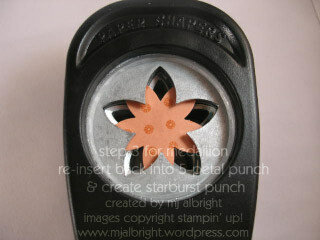 Love your starburst punched flower card! You will enjoy California! I have lived here for over 40 years in soutern Cali. Is the convention in Anaheim ? That is where Disneyland is. I am in San Diego south of there about 1 + hour, near coast. How do you come up with this stuff … it truly amazes me! Very creative girl, and I thank you for your willingness to share with us all! Have fun in California! Can I tell you how much you rock! Awesome ideas, MJ!!! I was browsing for cards using Ginger Blossom, and found your wonderful tutorial. I’m a subscriber now! Very cool! I saw something like this once before and I have tried playing around with it but was unable to reposition the punch image inside the punch and get it lined up correctly. Is there a secret to this? Thanks for sharing your tutorial. Fabulous work! 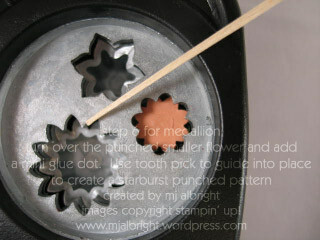 This is such a great tutorial – it’s never occurred to me to use the punches like this! Thanks so much for sharing! Hi, could you help?? I did this and I to have tumbs when it came time to keep the flower in the punch to repunch for the medallion…..what did you do to hold it in there and turn. Please visit my blog to let me know! Thanks so much! You’re coming to CHA!?!? Oh… I can’t wait to meet you!! YAY! btw, love what you did with the punches!! I think I need to get some more punches! These are fab! Come and check out my SU alphabet challenge blog if you have time! We’d love to see some of your creations on there! 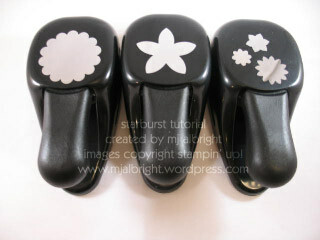 do you now where can I buy online the jumbo scalloped circle punch?? I live in Guatemala, Central America and they don`t sell the jumbo or even the large one in the scrapbook stores here and I haven`t been able to find one online so please help me!!! You use the most amazing color combinations and you are so dang clever and innovative.. Thanks for sharing. I just love your blog & especially how you share all your great tips, techniques and ideas w/us. I had such fun trying this technique for the SCS challenge today. Thanks!